When it’s broken, we can fix it! 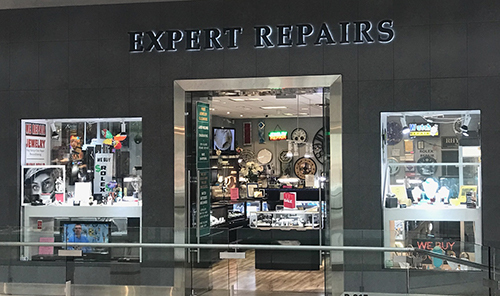 Expert Repairs is your destination for a wide range of consumer goods professional repair services, including repairs for watches, clocks, jewelry and eyeglasses. We also provide in-house services such as engraving and knife sharpening. Let us recoup the value of your items! Visit our shop today in the Westfield Palm Desert mall, near Macy’s (upstairs). Just because something is broken doesn’t mean you need to get rid of it—especially if it’s a high-value item or something that has sentimental value to you. Instead of replacing your items, repair them! Expert Repairs is ready to help. Our shop is well-equipped to handle everything from watch and clock repairs, to knife sharpening, to eyeglass frame repair, to jewelry repair in Palm Desert, CA and more! We’re the destination for people who want to refurbish their cherished items and enjoy them for years to come. Count on us for exceptional repairs, whether you’re bringing us a pair of off-the-rack glasses or a luxury Rolex. We give your items the attention they deserve. In addition to providing repairs for your items, our shop also offers a variety of specialty services and items for sale. Come to us for a selection of jewelry, including custom-made rings. We also sell gold in Palm Desert, CA. Need an item engraved? Come to us! We engrave in-house and can help you commemorate a special event or occasion with the right message on a sentimental item. We even have the ability to argon weld custom frames for your glasses. Our dedication to our customers even involves house calls for grandfather clock repairs. Stop in today and see all of the products we offer or to learn more about our services. We’re prepared to go above and beyond to guarantee your satisfaction! Our store has the ability to repair a wide range of products, including jewelry, watches, clocks, glasses and more. We can even sharpen knives! Our repair technicians are familiar with many of the top consumer name brands, offering repairs for designer eyewear, as well as luxury watches like Rolex. We have repair experience that stretches all the way back to the 1980s, giving us the expertise to repair items that are brand-new, as well as decades old. We’re a locally-owned, community-focused business that works hard to provide value to customers by minimizing repair costs for items you’ve already invested money in. Our repairs and other services are all performed in-house, giving you the peace of mind that comes with only our team handling them. Damaged jewelry? Broken watch? Dull knife? Bent eyeglasses? Whatever you’re dealing with we can fix it! Stop by our shop today to consult with an Expert Repairs technician. "Took a 62 year old Longines watch to be repaired. The work was completed in a week and the watch is now running flawlessly. My husband bough..."
"What a gem!!! I had a watch that needed to be resized & they did it at no charge! My daughter was also offered a prize out of a basket which..."
"Joseph is excellent to work with and he has very FAIR PRICES. I love all his whimsical clocks he has displayed on all his walls. He is every..."